The World Series of Poker has announced one-day fantasy sports leader DraftKings.com as the official fantasy sponsor of the WSOP. As part of the partnership, DraftKings will be awarding Main Event seats as prizes leading up to the event. 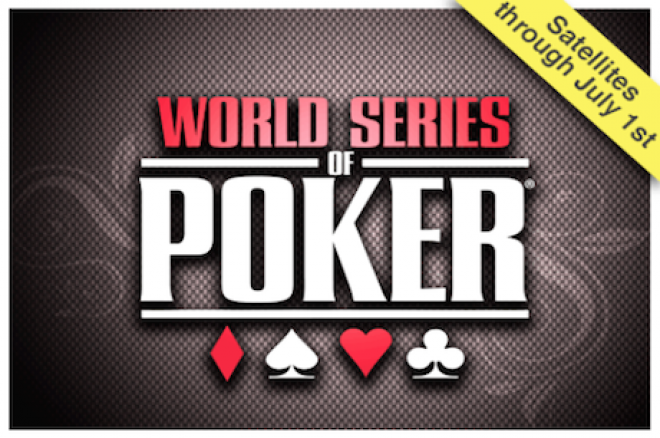 Previously, you had to reside in either New Jersey or Nevada to qualify for the WSOP online. No more. Poker and fantasy sports enthusiasts across the country can qualify online for as little as $2 — or FREE if you’re a new depositing user on DraftKings. Starting now through July 1, DraftKings will be running satellites where the grand prize is a WSOP Main Event Prize Package worth $12,000. One-day fantasy sports are simple, easy, and perfectly tailored for poker players. You draft the best possible team under DraftKings’ salary cap, follow the action live, and claim your prize immediately after the games conclude that night. In this case, your prize could make you $10,000,000 down the line! There are plenty of reasons to play. If you ever wanted to participate in the Main Event but didn’t want to pony up the $10,000, or are simply interested in additional ways to win huge prizes, you should be checking out DraftKings. Right now, in addition to the exclusive partnership with the WSOP, DraftKings is offering to match your initial deposit dollar for dollar (up to $600) and giving all first-time users a free contest entry.